Much like the SDLP, the Alliance Party, without an Assembly to influence or a looming election to fight, struggled to inject a sense of urgency into their annual gathering of members. You would be forgiven for thinking that the SDLP, whose conference came a fortnight after, had cherrypicked several soundbites from Alliance leader Naomi Long and deputy Leader Stephen Farry. Similar themes included addressing the negative mood currently engulfing Northern Ireland’s politics and using the inspiration of what was achieved back in 1998 to plough a furrow towards a stable, integrated and reconciled future. However, such is the struggle to stay relevant for those parties in Northern Ireland, unwillingly locked out of Stormont and electorally excluded from Westminster, that delivering a road map for the future around the 20th anniversary of the Good Friday Agreement was always going to invite some crossover. Brexit and local government were the main discussion points before Stephen Farry spoke to party members. He bemoaned the impact polarising politics in Northern Ireland was having on implementing necessary change and reform. Investment Strategy, no Social Strategy, no Skills Strategy, no Productivity Plan,” he pointed out. 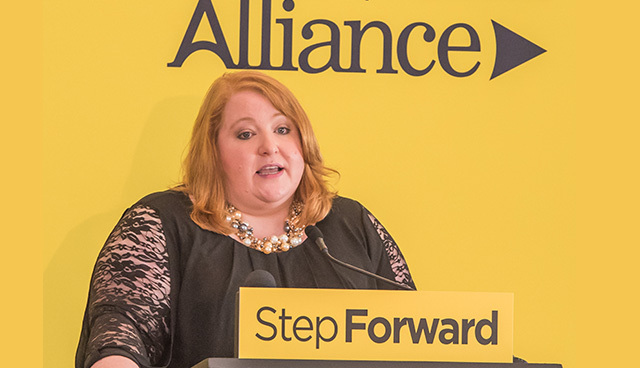 Farry’s speech was a precursor to that delivered by Alliance leader Long who opened her speech with optimism around the party’s growth in a year of political frustrations. Pointing to “a strong campaign” for the Westminster election, a consolidation of results at Assembly level and “new members stepping forward in record numbers”, she outlined her belief that Alliance members are not only increasing but cultivating in new areas. The leader did take the opportunity to take a swipe at recent Stormont failures; raising RHI; a “conspiratorial” approach to Freedom of Information and party donations. The Alliance Party’s route map to restoring devolution, Next Steps Forward, was published prior to the conference and calls on transitional Assembly arrangements and Westminster to legislate for “key devolved matters” such as the Irish language and equal marriage, while also addressing the reserved matters of petition of concern and around legacy. “We will not simply stand on the side-lines, wringing our hands, or worse, add to the problems by pointing the finger. Even if we are at times slipping notes under a locked door… we remain absolutely determined to play a positive role in getting devolution restored,” said Long.